How Much Does Your Disco Cost? The price of the Discos vary depending on what show option you book, the times of performance, any additional requirements such as extra lighting, access to the venue, travel distance to the venue etc. All of my prices are below which will give you a good guideline and there are pictures of each show with a description of what they are on my “Shows & Packages” page. If you are looking for a cheap disco I am probably not the right DJ for you however I am very good value for the service that I provide, the quality of equipment that I use and very competitive in my pricing with similar DJ services at this level. You have music throughout the day for the drinks reception and wedding breakfast, microphone for the speeches, a DJ to make important announcements, uplighting to match your colour scheme to make your reception look beautiful and the “Minimal Show” for a 4 hour evening disco. • Uplighting the evening reception room to match your colour scheme. 8 uplighters are set up in the evening reception room which may also be your wedding breakfast room. They are set to your colours for the day and your first dance and then flash in time to the music when the dancing starts. • Background music for a drinks reception played through a battery powered speaker which can be used in any dry area. • Any special announcements during the day. I make important announcements on a discrete sound system in your wedding breakfast room during the day. It can be used to give you a grand entrance into the room to music for your wedding breakfast (there is an example of this on my website), introducing the speeches and making special announcements like cutting the cake. • A radio microphone for the speeches to ensure that everybody can hear them, even at the back of the room. • The high quality “Platinum Show” for a brilliant evening disco for up to 5 hours. • A planning meeting to make sure everything is organised from the music, timings and special moments throughout the day to the colour of the lighting. • On-going email support to answer any questions for peace of mind. The Premium All Day Wedding Package is a very popular option which takes the day to another level and includes everything from the “All Day Wedding Package” but also includes the upgrade to the “Wedding Show” for a 4 hour disco with more lighting, uplighting, and special personalised wedding design touches. This is a more impressive personalised evening disco especially designed for a wedding with Love Heart gobos and your names projected onto the dancefloor with a custom designed monogram, a unique custom “Love Letter” DJ booth lit to your wedding colours, and a backdrop of 4 uplighters programmed to your colour scheme. • A Grand Entrance to music of your choice to the wedding breakfast. 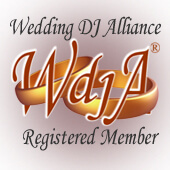 • Background music played during your wedding breakfast to create the perfect atmosphere. • The high quality “Wedding Show” for a brilliant evening disco for up to 5 hours. The lights are set to the colours of your choice and can be changed during the night. The lights can be dimmed, changed to pre programmed colour combinations or gently faded from one beautiful colour to another.